I have published a few non-fiction anthologies over the years and they have all been successful, both from a research and publishing standpoint in the beginning, and a sales standpoint later. There is a right and wrong way to collect and publish stories contributed by others. In Part I, we discussed how much to pay contributors and what rights to request. Today, we’re going to discuss contracts, how to find contributors for your anthology, paying your writers, and more. I use a very basic, one-paragraph contract for my anthologies and I accept the contract by email. I create the contract for each project before I start soliciting stories so I can provide that contract to all potential contributors. That way, they know up front what rights are being requested and what the payment amount and method of payment will be. See more below. Your ad should describe your project in detail, and should state the desired word count (if any), rights being requested, payment amount, payment timeline (you should ALWAYS pay on acceptance) and payment methods (check, Paypal, etc.). 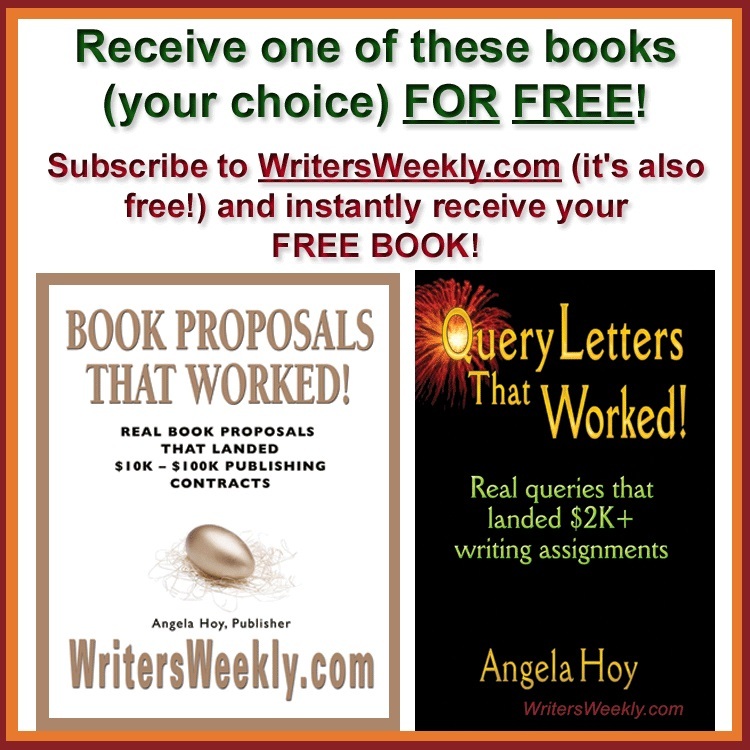 At WritersWeekly.com, we frequently receive emails from writers needing query advice. While we dispense that freely, we feel that providing copies of real queries that resulted in real assignments would be a better alternative to those who just haven’t figured out how to create successful queries. We are publishing a book of successful query letters that resulted in assignments of $2K or more. If you have written a query letter that resulted in a $2K or more freelance assignment, we’d love to hear from you. If your query is chosen, we will need non-exclusive rights to what you submit and we will pay you $50 on acceptance. We will also send you a copy of the print version of the book when it is published. When first contacting us, please only send a brief description of your experience via email. There is no need to send anything else at this time. You can post your ad to the forum at WritersWeekly.com (http://forums.writersweekly.com/viewforum.php?f=4), or at oDesk.com, Craigslist.com, and a variety of other sites that offer free “job” listings for writers. Do not ask writers to write for you on spec. Writers should not be expected to write test pieces for your project. A simple query letter and a sample or two of their work is all you need to make a decision about offering them an assignment or not. When I begin soliciting writers for an anthology, I create a spreadsheet to track the contributors. 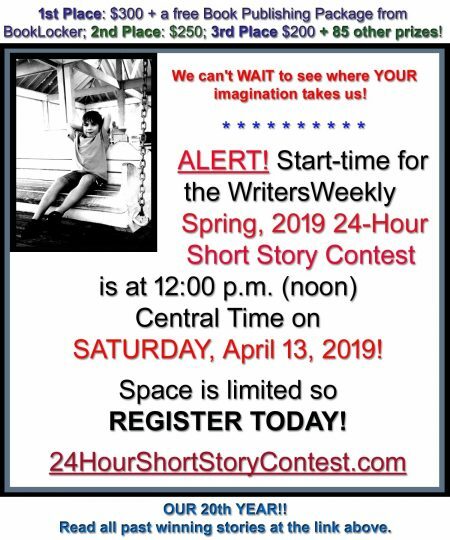 I add columns for their names, addresses, and email addresses, and then I have boxes to check off for query received, assignment sent, submission received/accepted, payment date, and print copy of book mailed. When you’re working with a dozen or more contributors, this type of organization is absolutely necessary to ensure nobody gets forgotten during any of the steps toward publication. When writers respond to your ad, you need to have a form letter response ready to send back. We sincerely appreciate your interest but it doesn’t look like your contribution is going to be a good fit for our book. I’m sorry. Thank you so much for taking the time to contact us today. – Information on the actual assignment (Name of publication, rights purchased, the amount the writer earned, etc. ), and a brief paragraph from the author on how they landed that assignment (followed the guidelines? simultaneous submission?, etc.). We are offering $50 on acceptance for the non-exclusive right to publish the info. above from each chosen contributor. I will also mail a free copy of the trade paperback to each contributor, of course, when the book is published. We only need these two things in order to narrow down the many submissions we’re already receiving for this project. In addition, each contributor for the queries selected for publication will need to be able to prove to us that the amount received for that article is what is claimed (we don’t want to get sued by any of the publications that bought the articles). An email assignment or copy of the contract (again, via email is fine) will do just fine in these cases. These will not be published, only kept on file. But, we won’t need that info. unless your query is chosen. NOTE: The queries need to be for articles that are not too technical in nature. (While some technical queries are great, we don’t want our readers getting fuzzy-eyed while reading the sample queries). If this is something you’d be interested in contributing to, please send your info. per above to me here at [email address]. Once you decide to assign a piece to one of the writers, you will need to send them an email order that includes your contract terms, word count, due date, etc. We’d love to include your query in our new book! We are offering $50 on acceptance for the non-exclusive right to publish your submission. We will also mail a free copy of the trade paperback to each contributor when the book is released. 1. The query letter and details about the assignment as outlined in our previous email to you. 2. Your address (for payment by check) or Paypal ID (for online payment). 3. An email statement from you granting me the non-exclusive right to publish what you sent. You will retain rights to your work, of course. 4. Your bio (we will run this at the end of your story). The bio is optional. Please let us know if you want us to use a pen name for you, or just initials. If you have a book or other products/services you want to promote, by all means, include that info. in your bio! 5. We might publish contributors’ photos in the book. If you’d like to be included, please submit a high-resolution (300 dpi) photo with your piece along with a statement confirming you own all rights to that photo and that you are granting us the non-exclusive right to publish it. NOTE: We offer a 100% kill fee. If we decide not to use your piece, you will still be paid. If these terms are acceptable to you, please consider this your contract. When someone submits their contribution, you need to immediately acknowledge acceptance, read it, accept it (or reject/order rewrite, etc.) and send payment to them. Do NOT make your contributors wait for payment! If you do, you can bet they are going to start talking about your late (or non-existent) payments online. 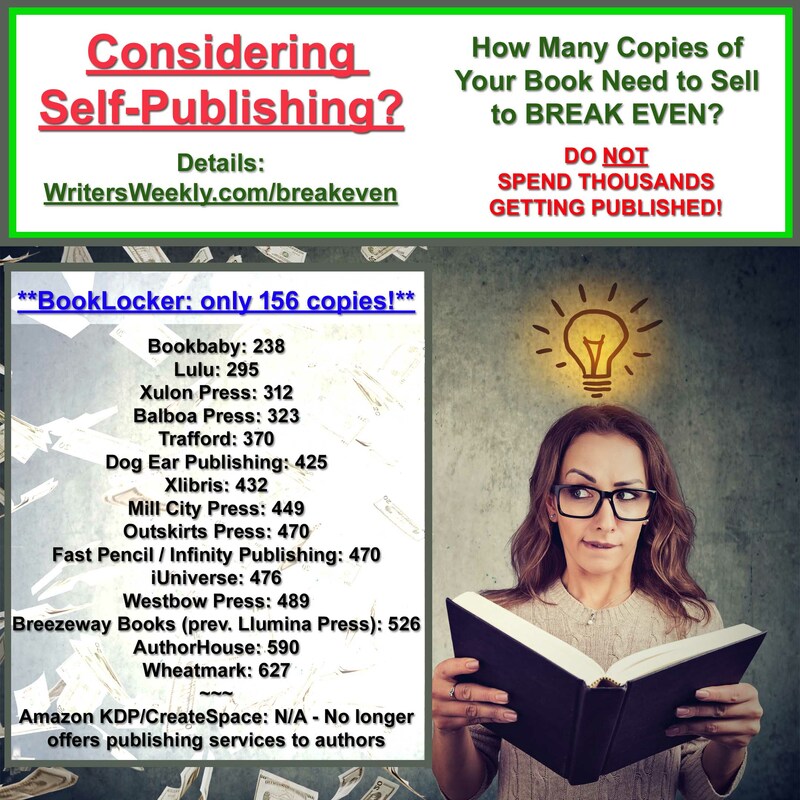 There’s no faster way to ruin your reputation than to make writers wait for payment! What you sent in will work very nicely in the book. Thank you so much! I am immediately mailing you a check for $50 (or sending payment via PayPal) for the non-exclusive right to publish what you submitted. When payment arrives, please send me confirmation that you have received it. Once the print version of the book is published, I will mail a copy of that to you as well. We hope to have the book on the market by [mm/dd/yy] but, of course, that might change because we still have submissions coming in. If your address changes during that time, please let me know. In Part III, we’ll talk about the editing, formatting, and publication process. 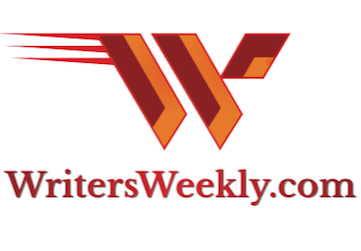 If you are not a subscriber, please subscribe to WritersWeekly.com (it’s free!) so you can be notified when next week’s issue is released.